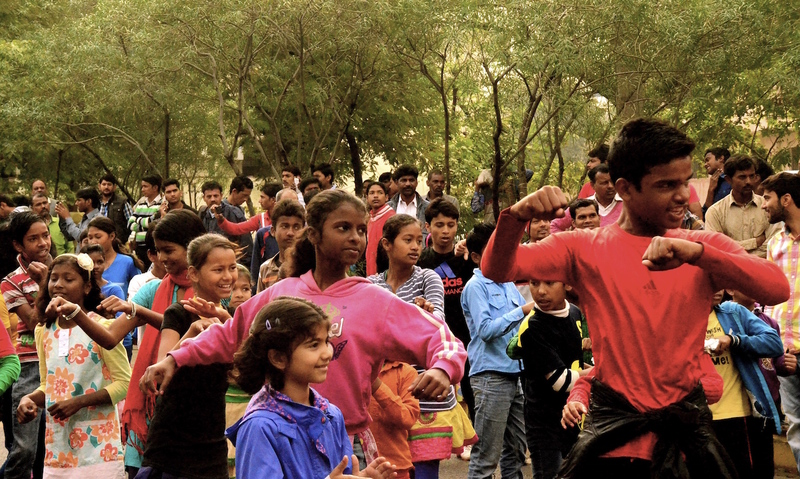 Walking back from our Kathak morning at Raahgiri, we ran into a really peppy zumba session. Now, salsa beats never fail to do their thing and I found my feet tapping along of their own volition. Aadyaa was absolutely mesmerized by the energy in the air. With an exchange of glances that signified permission, she darted into the crowd and began to follow the instructor on the stage. She joined a sea of kids, both boys and girls, ranging from age 5 to people in their late teens. Most of these super enthusiastic youngsters were from economically underprivileged households. You could see that from their clothes and many of them had the typical light brown streaks of malnourishment in their hair. But their energy and enthusiasm surpassed anything I had seen before. They watched keenly and absorbed the instructor’s every move, even his expression and the nuances of his dancing. The workout, as I mentioned before, was based on Latino forms of dance, which are not familiar to most Indians. But these kids had it down pat. 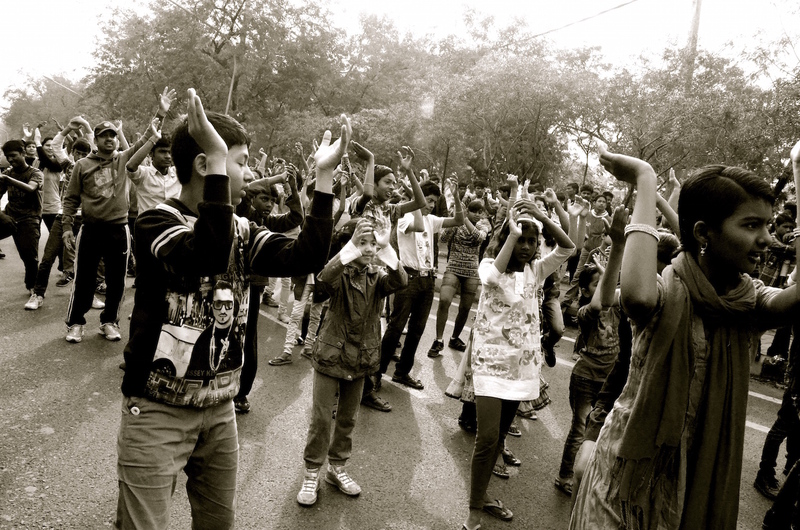 Many of them, it appeared, had been at Raahgiri before and memorized the basic steps already. One girl (in the pink sweatshirt) and a young man (in a red tee) stood out in their attitude and total involvement. 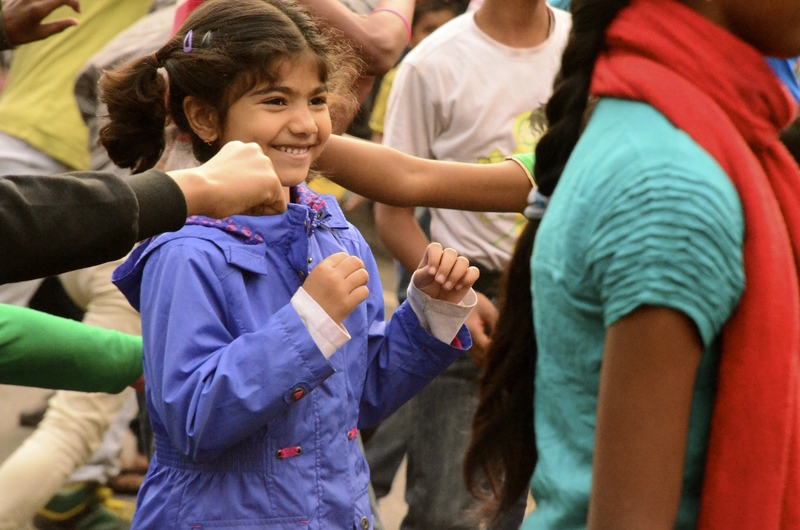 They, and not the ones up on stage, were the talented artists at Raahgiri this morning! The instructor was right up there. Jumping, bumping, grinding were all part of his repertoire. All the funnier for seeing little kids try to imitate his moves! 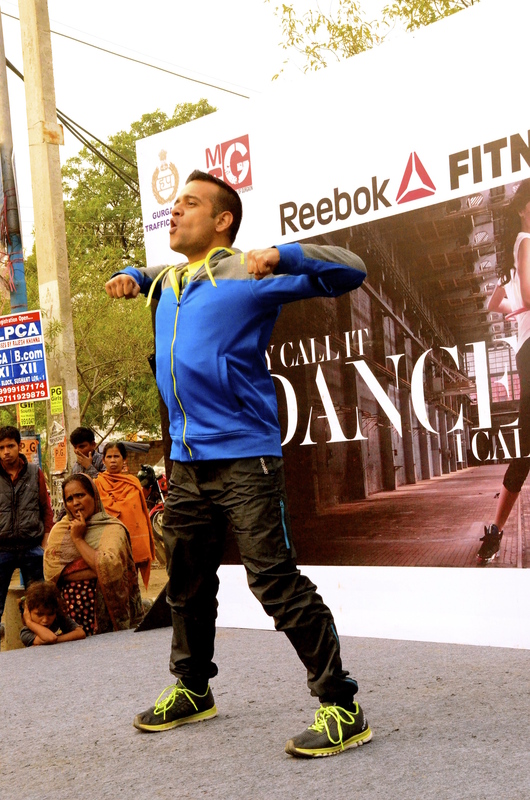 Posted on March 22, 2015, in Arts and tagged dance, participation, public spaces, Raahgiri, zumba. Bookmark the permalink. Leave a comment.